Even as the CD companies are facing their demise, they continue to churn out recordings with astonishing frequency. Since it's the Handel anniversary year, we're being inundated with all kinds of operas that most of us have barely heard of – we plan to publish reviews of Ezio and Faramondo over the next few days, for instance – which begs the question of why some of these projects ever get off the ground if they're not even going to come close to bringing back their production costs. Of course, it's a different matter with better-known works such as Tamerlano, which I reviewed on a DVD with Domingo a couple of weeks ago, and now this Alcina. The piece has enjoyed several previous outings in the studio, including a classic account with Joan Sutherland, a starrily-cast version under William Christie with Renee Fleming and Susan Graham that purists love to hate, and another recording with Arleen Auger under the late Richard Hickox. There's even a live recording from Munich with Ivor Bolton leading a cast that includes Anja Harteros and Vesselina Kasarova. None of these versions are perfect, whether it's because they sound old-fashioned (in the case of Sutherland), or have controversial casting (Fleming), or are bloodlessly conducted, and several critics are hailing Archiv's new recording as the finest to date. For me, it's slightly less clear-cut. On the good side, the set features three superb female soloists, but on the negative, there are three disappointing vocal performances, and overall I'm not convinced by the slightly clinical, understated approach of conductor Alan Curtis. 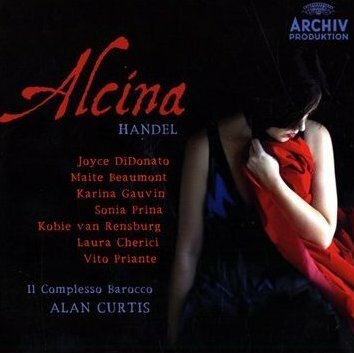 Alcina was one of Handel's biggest success stories. It received eighteen performances during its original run – more than any of his other works of that decade – and proved the operatic hit of London at the end of the 1734-5 season, in which Handel's company had been engaged in a kind of 'ratings war' of his day with another faction, the Opera of the Nobility company whose star singer was Farinelli. The two companies did battle, but according to David Vickers' excellent liner note, Handel won the day spectacularly. Indeed, the contemporary historian Charles Burney said that Alcina was 'an opera with which Handel seems to have vanquished his opponents'. Itturned into one of the greatest triumphs of his career. Chivalry and heroism characterise Ludovico Ariosto's poem Orlando furioso, from which Handel took the stories of Alcina, Orlando and Ariodante (all of them written in the mid-1730s). As ever, anguish and joy lie side by side, and Handel evokes each emotion with his usual vivid mastery. Vickers' liner note gives a fascinating account of the composer's self-criticism in creating this score, from the omission of recitative and whole numbers to the modification of small details. Though the opera took a relatively short time to write, then, it was not done lightly, and it should not be taken as such, despite the typical Handelian mixture of mistaken identities and disguises. This new recording is interesting partly for the casting of a mezzo-soprano in the title role. Anyone wondering about this aspect should worry no further: Joyce DiDonato triumphs completely, and if her standard of artistry were achieved by everyone involved, the set would be an unmitigated pleasure. Her six solo numbers are phenomenally well worked-out, mixing an intimate and personal response to the text with the technical assurance to spin out long lines and operate in a tessitura that takes her slightly out of her usual comfort zone. There isn't a better Alcina on record. I'm impressed, too, with Maite Beaumont as Ruggiero, singing as beautifully as DiDonato if not with the same level of refinement or detail ('Mi lusinga il dolce affetto' is a highlight), and Karina Gauvin as a luscious-voiced Morgana. However, for me the female line-up is marred by Sonia Prina, making heavy weather of the coloratura passages and sounding strained and very much out of sorts as Bradamante. For my taste, too, Kobie can Rensburg's tenor is too light of tone for the amount of detail he tries to pick out of the text and I prefer less use of vibrato in Handel than Vito Priante uses as Melisso. Nor do Prina, Priante and Rensburg always sound at ease with the tessitura, even if it's DiDonato who ought in theory to sound less comfortable than she does. What's more of shame is that Curtis' reading of the piece does not enliven it as a stage work deserves. Too often the singers sound like they're standing and singing concert arias in a studio, rather than turning into opera characters. The words ought to matter more, and it should all be a lot more three-dimensional. And though it seems invidious to criticise the elegant playing of the period ensemble Il Complesso Barocco, I'm sure a richer and more exciting string sound can be created than is the case here. It doesn't help that Curtis' beat tends to be rather rigid and often slow, leading to an enervated performance of the numbers involving the weaker singers. When DiDonato, Beaumont and Gauvin are centre-stage, though, the drama gels, and it's exciting. Joyce DiDonato returns to Covent Garden in July to sing Rosina in Rossini's Il barbiere di Siviglia.